The Microphone Madness MM-STEREOTRIPODS Mini-Tripod Omni-Directional Stereo Microphones are flexible and adjustable microphones / tripods with a total separation up to 16.0' (4.8m). 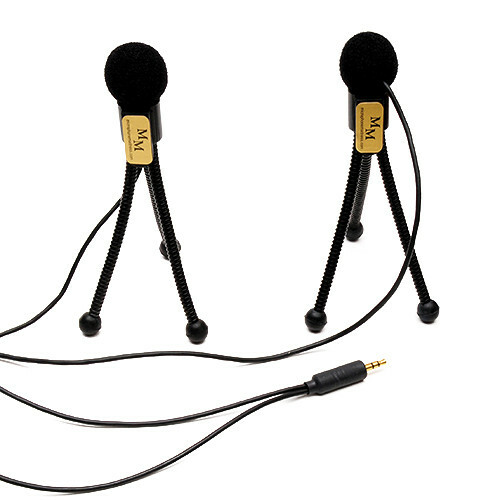 A miniature high performance balanced Mogami microphone cable exits the side of each tripod and terminates into a stereo 1/8" (3.5mm) gold plated connector. The rugged design allows the user to bend and mold each tripod to a desired position. Each unit stands 6.0" (152.4mm) tall, comes with premium windscreens and built-in belt clips for carrying convenience. These sturdy microphones are well suited for table top recordings, lectures, business meetings, rehearsals, court stenographers, and videographers. The microphones provide a crisp sound, with deep bass, smooth mid-range and clean high-range with a frequency response of typically 2dB. They can be easily plugged into any Minidisc, Dat, or Analog recorder that supplies a bias voltage of between 1.5 to 10VDC. Box Dimensions (LxWxH) 7.0 x 3.6 x 0.5"